London: Printed by C. Whittingham,... For John Harding..., 1804. Later edition. 4to., original paper boards, this copy has been rebacked with the remnants of the original paper spine laid down, 70, (2)pp. ads. With 32 leaves of plates, (30 “Dance of Death”, and portraits of Holbein and Hollar). This copy has been rebacked with the remnants of the original paper spine laid down, there is some light foxing throughout, occasionally affecting the plates, but the foxing to the leaves of plates is mostly confined to the margins. 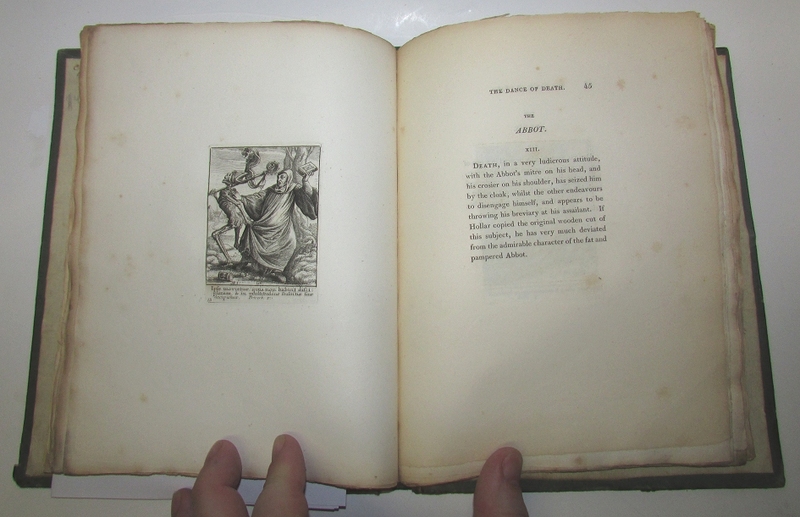 Overall a very good copy of one of the more uncommon editions of Hollar. 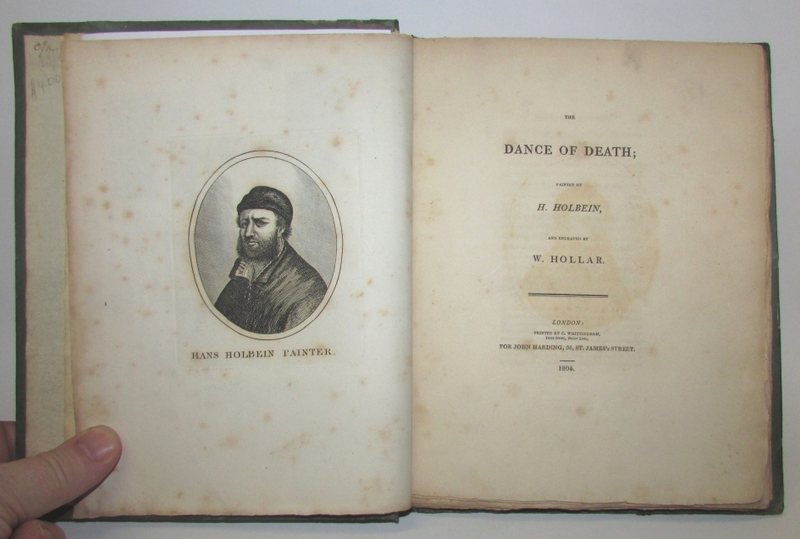 “The theme of the 'Dance macabre' dates back to the medieval morality tales of a dialogue between Death and representatives from all classes of society.” (Fisher/Hollar Collection) Hollar's prints, which re-interpreted Holbein's designs, first appeared in 1651. There were 30 prints, each within decorative borders designed by Abraham Diepenback. They were reissued in 1680 with some changes made to the decorative borders. In 1780 an edition was issued in Basel, the plates lacked the decorative borders, and the portraits of Holbein and Hollar were added, along with an explanatory text to accompany the plates. 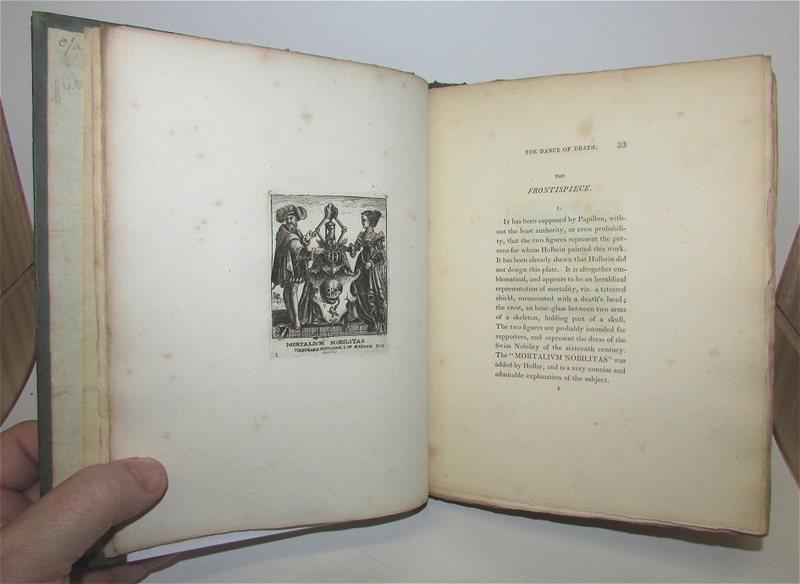 In the edition of 1804 (offered here) the plates are in the “third state”, “showing some reworking, and the addition of a sequential number in the lower left corner.” The plates were issued once again in 1816 (the 4th state) having been reworked once again.